TORONTO, November 1, 2017 – Today, MaRS and Grand Central Tech (GCT) announced the launch of MaRS@GCT, an extension of MaRS Discovery District in the heart of New York City. 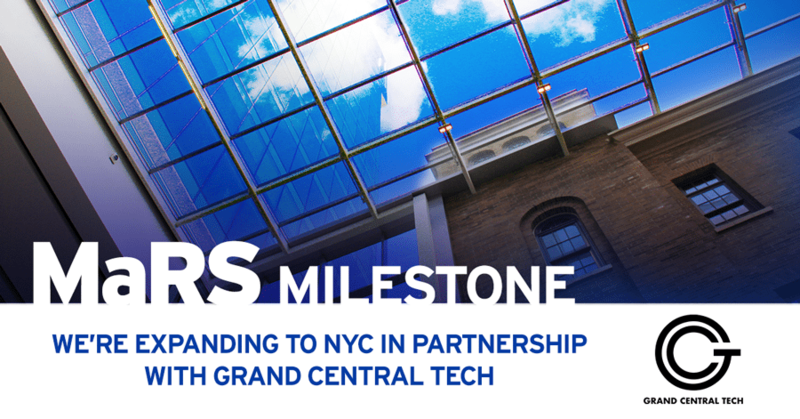 In collaboration with GCT—the largest innovation hub in New York City—MaRS will now offer support, services and physical workspace to Canadian technology ventures looking to expand their reach into one of the world’s biggest markets. The partnership will help Canadian startups with market-ready solutions to scale by providing access to GCT’s network of corporate partners and investors, as well as to connections to new global customers. Founded in 2014, GCT is New York’s premier venture platform, providing all the critical resources for transformational startups to achieve scale – all under one roof. GCT’s focus on innovation in health, fintech, smart cities innovation and the future of work aligns with MaRS’ sectors and complements the support that MaRS offers to Canadian entrepreneurs in Toronto. GCT will also offer temporary workspace to MaRS Growth and Scale stage ventures looking for a physical site in NYC. In turn, MaRS will leverage its internal expertise and programming to augment and add value to the GCT community, while providing bridge opportunities to connect the Toronto and New York innovation ecosystems. This collaboration is one of several that MaRS will establish in the northeast United States to help Canadian ventures boost export opportunities to the US. Earlier this year, MaRS partnered with ACRE, a clean energy incubator operating out of the Urban Future Lab at New York University. ACRE is helping Canadian cleantech ventures to navigate the NYC ecosystem and make the right connections with investors and partners. Spanning 100,000 square feet in Manhattan, GCT works with 100 companies, providing them with operational support, talent recruitment and development, flexible real estate, access to corporate partners and government agencies, guidance from mentors and advisors, and access to investors. MaRS supports over 1,000 startups across four key sectors—energy and environment, health, finance and commerce, and work and learning—with advisory support and connections to corporate customers, capital and talent. New York Metro funding increased by 57% this quarter, exceeding funding totals to San Francisco. Funding in Silicon Valley decreased by 46% during the same time period (PwC, CB Insights MoneyTree Report Q3 2017). New York City has twice the number of corporations than other metropolitan areas in the US and the third-highest density of venture capital after San Francisco and Boston. While Canadian ventures expand into the U.S market, American companies such as Airbnb, Google and Microsoft are going north, expanding into Canada to open satellite offices and to take advantage of talent and other opportunities. American talent is also looking to move to Toronto, and the Canadian government is making it easier for startups to bring in top international talent.